Replacement Convertible Tops - Maintenance or Styling Statement? Replacement Convertible Tops – Maintenance or Styling Statement. Many people claim that replacing a convertible top is really maintenance. We see it as a restyling option. I suppose we could argue the point but let’s just put down a few facts and you can judge for yourself whether installing replacement convertible tops is maintenance or a restyling statement. Remember When You Bought Your Convertible? There is no criticism of the auto manufacturers implied here. They know that choice costs money. Making many options available increases the cost of a new convertible. They operate in a competitive market and their price range is constrained by this competition. So options are limited to reduce the cost of the vehicle. Few car owners are prepared to scrap a perfectly good convertible top just because the color was not exactly what they wanted. However, once the top is stained, worn or damaged in any way you begin thinking of replacing your convertible top. Then you want the maximum range of choices possible. That’s where the aftermarket suppliers of replacement convertible tops stand out. 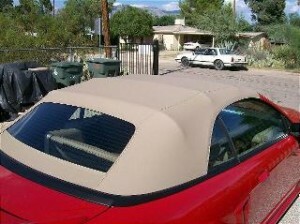 We see replacing your convertible top as your opportunity to express yourself with your choice of colors and materials. Why A Replacement Convertible Top? There are a number of reasons why you might wish to replace your convertible top. Each reason offers you the opportunity to restore the value of your car and, at the same time, to restyle it to reflect your personality. If your top was damaged in an accident or through vandalism you have a car that, technically, doesn’t have a roof. Your replacement convertible top is a necessity but it doesn’t have to be an identical replacement. In the aftermarket you have an almost endless array of color/patterns/texture choices open to you. The possible unique combinations are in the thousands. In short, you can design your own replacement convertible top. Click here to see the range of color and pattern options. If your top has been stained to the point where the stain cannot be removed, then the top has become a liability. Convertibles draw the eye to them. After all they represent only a very small percentage of all the cars on the road. However, if your top is stained and ugly looking it will attract the wrong kind of attention. The great thing about the aftermarket is that you can quickly return your car to its former beauty. Even better, you can enhance that beauty with your personal statement of cloth pattern and color. Finally, if your car is a few years old and is beginning to show signs of wear – higher noise levels, dust and water leaks – you know that its resale value has fallen. In addition, your convertible is no longer giving you the emotional payback you wanted when you first bought your car. Using aftermarket suppliers you can fix your concerns about your top and restore your car’s value. You can also come out of the deal feeling better about your car because you have renewed it colors and designs of your choice.